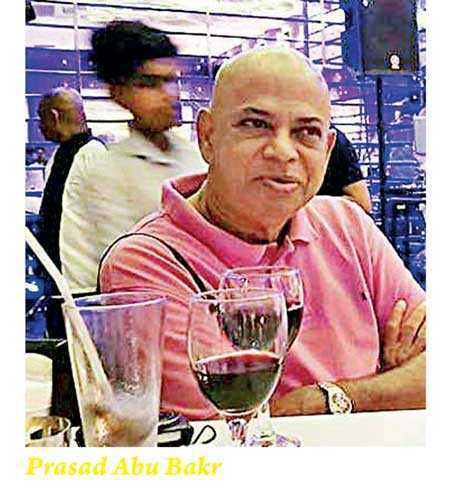 I have found that in my recent journey in promoting my art through various exhibitions – specially with my major breakthrough in 2016 sponsored by the Pegasus Reef Hotel with the help of its very innovative General Manager Harsha Jayasinghe and presented by the Alliance Francaise de Kotte (Colombo), followed by my participation in many other activities like ‘Kala Pola’ (the only annual Art Fair to take place in the country, generously sponsored by John Keells Holdings), the annual ‘Nawa Kala Karuwo’ (an ideal platform and testing grounds for newcomers to the art scene, organised by the George Keyt Foundation) and recent showing of my work at the Galle Literary Festival sponsored by Natalie Rogers of Fortaleza (a well-patronised boutique hotel inside the Galle Fort) – has brought me in direct contact with art lovers and patrons, which has actually further educated me on the subject of ‘this new art’ I am dabbling in, trying to combine two of my major passions (collage and photography) in creating a singular image of a perfect mix. It has worked in the sense of drawing spectators closer in wanting to explore ‘this new artistic creature’ born out of ‘copulation’ of two different artistic combinations – photo imagery and collage. In the case of what is termed collage by many artists is that they are adding scraps and pieces of paper towards enhancing their subject which is a painting by itself. Photography too has stood its own grounds as an art form over the years. But here, in my case, I am using the art of collage or in some cases mixed media to build an image around a photograph captured by myself. 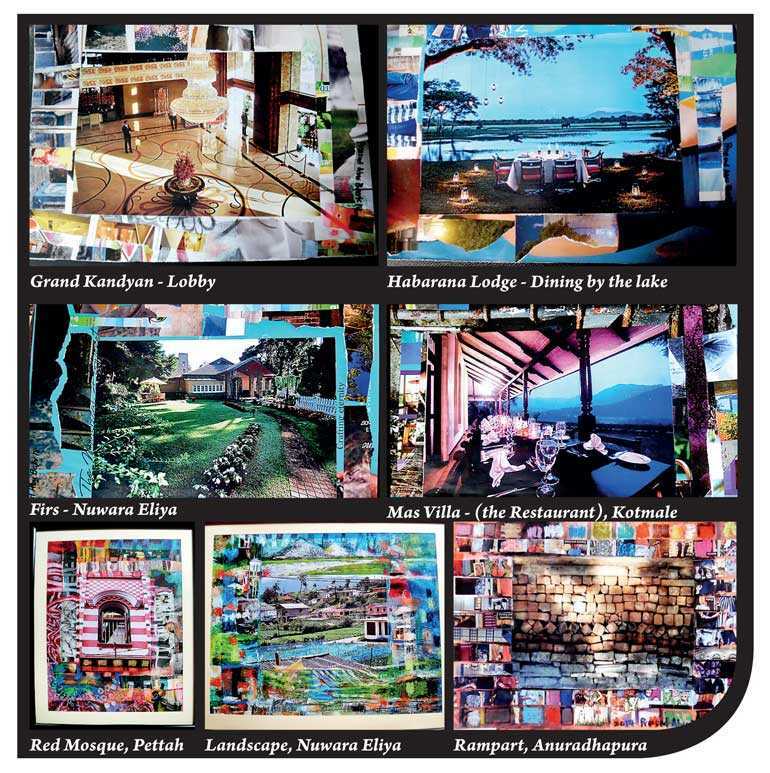 With ‘Destinations Sri Lanka 2018’ due to open at the Lionel Wendt Gallery on 20 September, I have in some cases used hotel images submitted by each participating hotel, as the exhibition is all about promoting locations and with hotels I have given them the opportunity in promoting the best aspects of their properties – which is to the best of their knowledge. So it is different again, as in this case I am working around images given to me by others. ‘Destination Sri Lanka’ is being planned as an annual ‘tourism off-season’ exercise – in consultation with hoteliers – one reason why many of the outstation resorts and hotels have come in with great enthusiasm. My own photographs are included in the case of destinations and a few hotels too. With ‘Destination Sri Lanka’ my work has taken a twist to become another art form, totally different from any regular art activity such as painting, drawing, mixed-media, photography, etc. When each one of them are brought into view as a singular art form, I too actively take part at times as an artist. I cannot stress enough on the therapeutic effects of indulging in art. I have found that this new form of artistic exercise in creating images through combining photography and collage has had a very meditative effect on me – it is almost like putting back some missing pieces together. Any activity involving sports, performing or the fine arts are definitely stress busters, but in this case it is almost magical – how the time-absorbing exercise of wading through pages and pages of various magazines and other printed sources to find ‘that perfect patch of a piece’ to enhance your creative artwork just leads one to realise how we have been doing the same in our daily lives over the years – trying and bringing the pieces together, towards forming a perfect combination – be it in relationships – work or travel.